That's a crazy amount of video! Various companies have launched cameras that can shoot 3D video, or 4K video, or video that covers 360 degrees or a sphere. HumanEyes’ Vuze aims to do all three. The Vuze includes eight lenses, which peer like binoculars from the four sides of the camera. Each lens, according to HumanEyes’ sales director Jeff Miller, is a 4K lens—meaning that the Vuze output should be 3D, with 4K dedicated to each eye. According to Miller, the output will also be spherical, allowing users to pan around the finished video. 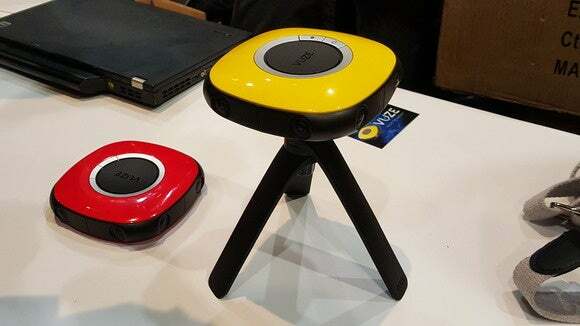 Once video footage is captured, it can be sent en masse directly to a PC or stored on a card within the camera, although it’s unclear whether an SD card will ship with the Vuze. Behind the scenes, HumanEyes developed software processing techniques to allow near-real-time video processing of the captured video, as well as seamless stitching on the fly. The company calls this adaptive blending, mimicking the way in which the human eye and brain process information. The Vuze will also be available with an optional accessory that serves as a stand—or, when folded, as a selfie stick. It’s unclear whether HumanEyes will be able to push high-def 3D spherical video into the mainstream—although early last year, Facebook unexpectedly began promoting high-definition spherical video for news. We’ll have to see whether news organizations sign on to this, or if it becomes the next big format for, say, weddings. The Vuze has a tentative preorder date scheduled for March, with expected shipments beginning sometime in the third quarter of 2016. A price hasn’t been nailed down, though Miller said it should cost less than $800.